>>> 30 years ago this week, 53 americans tasted freedom after being held hostage in iran for more than a year. time that at least one tells me he is still trying to reclaim. >> good evening. the american embassy in theran is in the hands of students tonight. >> it is insulting to see them being held at prisoners. >> the crisis began when iranian students seized the u.s. embassy taking dozens hostage after the u.s. refused to deport the shah. they were held captive for 144 days. he was one of the hostages. >> i really felt after the first several months in captivity, that we would never get out. >> what was the dimmest moment, the darkest day you had? >> after we were disbursed all over the country many of us reis reasrea s asemabled in a prison. steel walls, bathrooms full of cameras to watch us day in and day out. it just seemed that the humiliation would never end. >> did you know that ronald re reagan had be elected? >> they had the notion that regan had freed us and it was carter. >> on the morning of the 20th, we woke up to open the door and there was no guard there. somebody said okay, pack up, you are leaving. >> once we crossed the border, the turkish border, we broke out champagne and started to have a good time and we knew we were actually free. >> freedom that came with a cost still felt today. >> there was no feeling of freedom like the one that i had 30 years ago. >> rosen and many of his fellow captives are marking the 30th anniversary at a reunion this weekend at the military academy at west point. 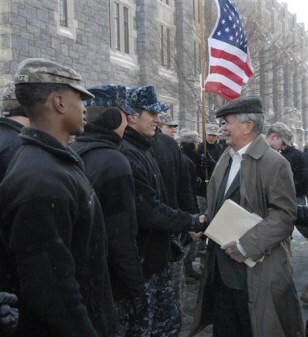 Former Iranian hostage Bruce Laingen stops to talk with cadets at the U.S. Military Academy at West Point, N.Y., on Friday.